The Amish medical experiment — no vaccines, no autism; is there a link? “People outside the alternative health community are often confused by the lack of autism in the Amish people. The Amish do not experience autism, or any of the other learning disabilities that plague our technological society. The Amish live in a society that consists of outdated technologies and ideals, by contemporary standards. Their diet consists of eating organic, fresh, locally-grown produce, and of course, they do not follow the established vaccination routines. To the dismay of the mainstream media and the medical establishment, this has resulted in a ier people, that are void of all of our chronic diseases. Heart disease, cancer, and diabetes are virtually non-existent in Amish villages. Equally non-existent are modern, chemically-engineered medicines, enhanced (chemically-engineered) foods, G.M.O. foods, and of course, vaccines. How is it that those who are without the “miracles” of modern orthodox medicine are healthier? The truth about health, medicine, and how they both relate to the Amish is becoming an embarrassment to some rather powerful people. Read it all on West Virginia Outpost. “and of course, vaccines”? Source, please? They have no problem with modern medicine, and according to a doctor in Lancaster County, PA 70% of them get vaccinated. Some Amish do have Autism too though, but at a lower rate than the general population. You might try sourcing common sense, lady. Vaccinations, like antibiotics, used sparingly and free of money corruptive influences, might have very specific life saving benefits at certain times. But continually overdone, mixed with other suspect chemical agents, and ruthlessly thrust onto a gullible and trusting public by corrupt agencies, they create and are responsible for atrocities. Or take something like sody pop. Does it taste good? Mmmm, maybe, huh? (I don’t drink it.) But go chugging it down by the shopping cartful like I see people doing and you get obesity, diabetes and mouthful of rotting teeth. Just going to say right now, that I am a very faithful Christian, so this hopefully puts down the rude remark about the people, who do not believe in a link to Autism and the vaccine, thinking this is “God’s fault.” I do not think it is anyone’s “fault,” especially God’s. Personally, I am going to choose to vaccinate my kids even though there is not definite proof that the MMR vaccine (and suspected others) does or does not cause Autism. The lesser of the two “doubts” is that, in my opinion, there is not enough evidence to link the vaccine to Autism. The Amish also have less genetic variation and express more of a Founder Effect in their community, which I think supports the idea that autism can be mostly influenced by hereditary factors, along with possibly a few other factors (I know some people believe that mercury in the environment can be a cause). So, maybe the Amish are less likely to carry this gene. Another idea was that, if the vaccine was in any way linked to Autism, you can separate out the vaccine (into three separate ones for Measles, Mumps, and Rubella) and that could lower chances. The original study about the link in the 1990’s had a lot of flaws to it, in my opinion. Like for instance, the guy who originally conducted the study administered the vaccine to all the kids participating in the study and did not have a control group of kids who did not receive the vaccine to compare his results to. Also, he gave the vaccine to the kids around the time Autism usually develops anyways. But then again, there are studies that suggest that the vaccine may be linked. Sorry for my lengthy comment haha. My major consists of a ton of classes that discusses disease and medicine and I find this stuff really interesting:) hope you are doing well! We need to understand how the industrial complex works. Here is a very good video.That attempts to explain some of it. Please take some time to watch it. Sara, your information is coming from a dot gov web site. Not reliable in this instance because they’re the ones trying to deny Dr. Wakefield’s research. I believe Wakefield long before I believe anything on a dot gov web site, for sure, I don’t care if it is pubmed. And CNN? Oh puhleeze. Let’s get some more reliable sources. Wakefield’s research has not been disproved. You mustn’t believe everything you read online. Go further into it. I’ve read several books by independent authors, and there are a few more I haven’t read entirely who all say the same thing. The Amish do more and more use cell phones and computers. And I know they use plastic in the kitchen because I’ve seen photos of it in cookbooks, etc. I don’t know much about their farming practices but I would imagine their use of pesticides is limited, as you say. In this case, I would have to vote that you are the one who is, so far, misinformed. Seriously?! The Gov website is only showing the article abstract taken from the Pediatric Infectious Diseases Journal, which published the findings of a Polish study. The Gov’t didn’t make it up. The study is real. And CNN? You may not like their slant/bias, but in this case they report quotes and cite who said them and where the information comes from. It is all independently verifiable. Wakefield was stripped of his license in Britain, but you’d rather believe him than the valid sources Sara provided?! …..because you have an Amish cookbook (the closest thing you provided to a source for your own opinions!). You can vote all you like, but you are very much the misinformed one!! What about all the other differences between Amish society and other American ways of living? No use of antibacterials, lower air pollution due to fewer petrol engines in the communities, lower maternal stress (? ), better nutrition, lower diagnosis rates due to less practice of modern medicine, more exercise, etc etc. But none of this matters as the sole purpose of this article is anti-vaccination. By not looking at ANY other differences the article reads as closed minded and with a single agenda. If the author wants to be taken seriously then a more balance approach, with EVIDENCE is required. The Amish now use canned soups and lots of other “convenience” foods. Surprisingly, they use a lot of margarine, too. I have lots and lots of Amish cookbooks to bear this out. That’s why they now have some of our “modern” diseases, but few compared to the rest of the USA population. Has anyone thought to do a “study” of the elders of the Amish society? how many of them have autism? Because if there is no autism in the elders, THEN you’ve got something to compare. Otherwise, if their children are being vaccinated, all we’re doing here is comparing apples to apples, not apples to oranges. Of course the Amish children are showing signs of autism – they’re now being vaccinated!! Good grief. That doctor must be an idiot to make a statement like the one I quoted and not make the connection. Everything you always wanted to know (for sure)! You must be talking about the FDA! I’ve seen so many videos about the additives in vaccines, I have no doubt that autism is a side effect. I never remembered there being such a thing as autism in the 60’s and 70’s when I was growing up. Of course, then the public was getting inoculated for the basic (still existing) diseases, such as small pox. Other than that, I think we got DPT shots. Now, the list is endless. Look at how our own Government tries to push the flu shots every year, yet I’ve known people to take the shot and get the flu anyway. I think I’d rather take my chances. Thankfully, my daughter-in law feels the same way, and only has my grandsons vaccinated when it is mandatory (which seems like a lot more often than it used to be). I’ve noticed today’s vaccinations also carry more letters in their descriptions. I can only imagine what our own Government is putting into our children’s bodies, especially the way they are out to control the masses, it seems. A dumbed down generation will be easier to herd. Isn’t it sad, that as citizens, there are so many of us that no longer trust the Government that is supposed to represent us? Bruno Bettleheim of the University of Chicago had a huge autistic school for emotionally disturbed children (Orthogenic School) for children which was founded in 1915 because no one understood the disorder. People would come from around the country (of course those who could afford it), to have their children live in a community with teachers and a director who understood the disorder. How many other children went undiagnosed because of lack of information in the medical community where there or just children called slow or ‘children who would not listen’. My own father who would be in his mid 80’s had a severe case of ADHD if I ever saw it. I know he was not a child of modern anything having lived through the depression, on a farm, with home grown food, in a rural area with no vaccines. My own son has autism, actually ASD (Autistic Spectrum Disorder), which is a combination of many parts of autism from a head injury, how does one associate that with a vaccine? I think we need to look at the whole picture. nedlud sorry that you feel these are conspiracies?? Have you actually read that website and its info?… I would seriously be looking at vaccinations and be looking atothers for example: (smallpox vaccine) another lab made chemical to kill! All pharma is dangerous, another way of controlling and dumbing down the planet population I am afraid… The American Govt scares the F*#k outa me…. I was being sarcastic. Governments are a joke, and with all the weapons and power they possess, they are a truly BAD joke. As I mentioned once in a comment with regard to Michael Schmidt, things have become quite serious. Serious enough to essentially destroy the majority of life on the planet, especially intelligent life…. Wow. There are always more than one side to every story and situation, and this one certainly is a hot potato. Normally, I try not to comment on these things because the comments just generally get irritating. And I apologize if this comment is as well. Everyone is saying there IS or there ISN’T a connection between vacc. and autism. Maybe there is. Maybe there isn’t. Maybe its an ingredient IN the vaccinations themselves. Perhaps its one piece of the puzzle that’s causing the whole problem. Either way, I think we need to study ALL aspects and possibilities before condemning one or the other. Its time we all got off the “Let’s get mad and defend our unwavering opinions” bandwagon, and put all that energy into finding something that actually helps make a difference. Before we boil our brains out of our heads getting angry at the situation, let’s get proactive and be a part of the solution. Maybe its caused by our vaccinations. Maybe its not. Either way, we have autism, and its likely here to stay. It affects our children, and the lives of everyone they touch–emotionally, spiritually, physically, psychologically… It affects us all. Let’s do something about it besides fight over who caused it and who didn’t. Excuse me Sharon, but I guess I don’t follow the beginning of your comment. You say “it might be something IN the vaccines” . . .
Of course it’s something IN the vaccines. The act of vaccination itself wouldn’t be causing autism. And no, no one knows for sure what causes autism. My guess would be there are several mitigating factors at work. But I do believe vaccines are a major player. I also believe a lot of the work being done by Wakefield will someday be vindicated. Our immune systems begin in our gut, and that’s why he’s suspicious of the gut/autism connection. It’s not a big leap to think that mercury, formaldehyde, aluminum, thimerosol etc., might just be the root of it all. I don’t think people here are gonna care much about “who caused it and who didn’t” – until and unless we find out that BigPharma has a role. Then we’ll know who to blame and who “caused” it. It’s just odd that we didn’t hear much about anything like autism until the past 20-25 years. I mean, it might have been around before that time, but no one seemed to notice if it was, ya know what I’m sayin’? It seems to be a newer type disease, which is why I commented above about checking the elders in the Amish communities to see how much, if any, autism is present in those folks. There are of course no vaccinations. But 2 cases of autism in the Amish were vaccinated. Does that sound like a contradiction???? D. Smith is a self-assured extremist who gains some kind of satisfaction from proclaiming to understand this topic better than the rest of us. In the last comment, two sentences after stating “Of course it’s something IN the vaccines”, he/she states “and no, no one knows for sure what causes autism”. You sounded awfully sure in the first statement. Personally, I don’t claim to know or understand any of the science of vaccination very well. But I do know this; as long as the conversation is controlled by blowhards bent on winning the debate at all costs, whose statements are based on annectdotal evidnece hand-picked to suit their points, there can be no progress towards a better understanding, and more importantly, a cure. Mike, before you get your smart mouth on, why don’t you read all of my comments here? I read every one of your comments. You sound like a typical alarmist when it comes to this topic. Your mind is made up, I’ll not try to change it. My point is simply that one can make a louder noise in the fight against autism without grasping to conspiracy theories and misinformation. There is simply no scientific evidence to support your claims. It is all anecdotal, and therefore unreliable. Yes, I am an alarmist when it comes to vaccinating. I hope someday you do enough research to become an alarmist, as well. You seem quite uninformed on this issue. I would like to know what Amish community you studied to find this out. I believed this story at first until I spoke with my sister who works a lot with the Amish from 4 different states (medically works with them) and they have a lot of learning disabilities, including autism. Of course its alright to be alarmist, we are talking about the lives of our children here. If your house was on fire and the children were still in there, at possible risk, wouldn’t you be alarmed and panicked. I trust though that we all understand something sensible needs to be done to get to the bottom of what is going on. Its seems a natural choice to mistrust some pharma’s and their representatives, because they don’t always get it right, and when they get it wrong, it seems they often go into denial, as a matter of course to protect their business interests. I haven’t seen a company yet who said, “yes of course, it was us, we are to blame, and we will pay billions of $$ to correct the issue”. But I tend to agree with Sharon, throwing rocks at people over an issue is bound to end up distracting from a proper course of action and discovery. Its often difficult to remove the emotion, but it is a required step. The onus of safety is on the producer, and it seems to me that too many voices are casting doubt on the efficacy of vaccinations. If the blanket vaccination is supposed to solve the approx 1/1000 incidences of ill health, but ends up possibly creating 2/1000, i.e. more damage than it was supposed to prevent, then this result alone should cause us to be alarmed, and in the very least cautious until we understand the risks better. The research is limited, in that the time it takes for results to come to the surface are generally much slower in being released, than the ability of medical, government, and other institutions to release there beliefs about the product they are promoting. Until this is resolved, its a crap shoot! All I know is a good friend of mine was 4 years old, got vaccinated, and began immediately showing intense signs of Aspergers. However, any stigma is ultimately about those making these judgements. A lot of SE instructors I know prefer to use the term “learning differences” rather than “learning disabilities.” People need to face facts and realize what happens when you give your child toxic chemicals. Two people I know personally got their infants vaccinated, and that night went into their room and they were having a SIDS-like episode, blue faced, looking dead. Both gave mouth to mouth and got them breathing again. BOTH completely true stories, and both were the very night of the vaccines. This may be far-fetched or begin an inquiry. As a 75 yr-old, I’ve noted (haven’t we all) an alarming increase in diabeaties (however spelled), even now in the very young (under 10 years). Any chance due in part to vaccinations? My mothers entire family of siblings had diabetes years ago, so did my grandfathers sisters, my mom would be 82 now and my grandfather well in to 100 +. I think we are just able to diagnose these things earlier. Remember back in the 30’s children got sick and died at an early age of a variety of diseases. Do not think it had anything to do with vaccines which of course did not exist back then. @ Rob Cope: I think vaccines can play a part in diabetes, because they tend to mess with the immune system before it’s even had a chance to fully develop, but I think diabetes (type II anyhow) comes at a younger age because of modern, highly processed, additive-laden foods. Also, people don’t get enough good fats in their diet – like real butter, home-rendered lard, good quality bacon, etc. Too many hydrogenated fats and even trans-fats. The food manufacturers state on the labels “0 transfats” but that isn’t always true even if the label says so. I just read an article about this in the past couple of days and if I can locate it, I will post the link here. Our immune system starts in our gut and so I feel that vaccines AND foods can play a role in lots of illnesses, including diabetes. My wife serves on an IRB. She points out that essentially the Amish population is a “control group” in contrast with an “experimental group” (the non-Amish population) with vaccines as the variable. She says with the data from the control group nobody can assume vaccinations are safe. Did she explain how hard it would be to get IRB approval for a study on vaccination and correlations with autism, when the two sample groups have such drastically different lifestyles with too many other variables? The Amish experience autism at a rate of about 1 in 275. Still 1 in 275 is better than 1 in 110, which is what was reported in 2010. I’m sure the numbers have changed since that time, but I couldn’t find anything more current than that. There were statistics at the CDC and other dot gov web sites, but I don’t trust the CDC or any dot gov web sites to provide truly accurate information because they don’t want us to know the truth. If the mafia were in the business of providing this type of information I would find it more believable than anything from our gubment. Autism has always been around. Mild autism went Undiagnosed (or they were thought of as odd) years ago! Severe autism fell under mental retardation where they were hospitalized (institutionalized) where they were pumped full of drugs among other horrific things. I am the mother of an autistic child and would love to be able to blame it on something– but I know children who are autistic and never had vaccines and live very healthy lifestyles. What causes autism, what causes Down syndrome, what causes fragile x etc etc. if I spent all my time trying to find out I would miss out on my beautiful child who is here. All I’m saying is stop trying to blame and start finding ways to help. Autism is here what can we do now. Somehow I don’t believe this. I do believe vaccines are linked to autism. I can personally attest to the fact that there are children with autism who have never had vaccines, and who live a healthy lifestyle. 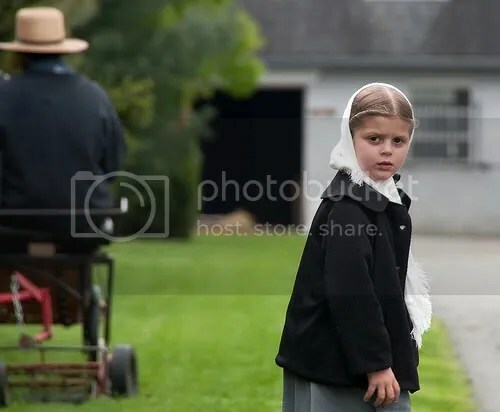 There are many differences between the Amish and the mainstream lifestyle so it is nearly impossible to pinpoint which of those differences could be a factor with the rate of Autism. One area that usually goes unmentioned involves factors such as maternal age and breastfeeding vs formula feeding. Amish typically have babies much younger than mainstream culture which is seeing a trend towards women waiting longer and longer to give birth which does result in higher medical risk factors. Also, there are many health benefits to breastfeeding and Amish would have a much higher breastfeeding vs formula feeding rate. Also, one has to wonder if there would be as much opportunity for diagnosis or awareness of Autism within their culture. Our children are afflicted with Autism because of the pollutants in our food, water, and air. Our industrialized society is to blame. Vaccines are not the problem and people need to stop focusing on it so we can put our energy into changing our environmental laws. Also, the Amish have different standards of “normalcy” and different standards in formal education. We try and force all of our children to learn, behave, and function exactly the same way, also based on an industrial factory model. Our diagnosis of Autism has gotten out of control. We need to start re-opening our minds to the fact that we all are not the same and realize that labels are more harmful than helpful. @ DD: I agree with most everything you say except the part about the vaccinations. Why is this such a difficult concept for people?? Vaccines are extremely toxic and they go right into the bloodstream. You mention the toxins in water, air, and food so you obviously know about them and how dangerous they are. I cannot think of a more direct way to effect the human body than to put foreign things right into the blood, can you? Aluminum, mercury, etc. The truth is that we are purposely exposing ourselves to unknown agents little by little to prevent the body from reacting to it as a invader. All deaths occur from a virus because the body attacks itself. Right now there is major epidemics going on especially now an all time high because of a lack of immunization and scare tactics like this which will actually do more harm if not protected than any handicap, like the body’s organs shutting down and wide spread of a deadly disease. Now the common cold and Ebola being treated as a common cold by trying to fight by bringing up the immune system is back wards from what they know about viruses, you should as a cure allow the body to incorporate the unknown agent, other wise you keep fighting it off and later on your body goes when weak into toxic shut down and phenomena sets in. Radiation the sun light has been proven to stimulate cancer and disease all ready inherited by 75%. Cover up and protect that stimulus goes down. The FDA would have you believe that asbestos and cigarette’s cause cancer, but reality is you can’t cause cancer its hereditary. When questioned in this line of light they actually tried to make it out like its proven again because those who have cancer genes are more susceptible to cancer being stimulated by these things, but still does not prove it caused any cancer. I believe genetics’ and passing along of abnormalities is often blamed by outside influences but many over look the sun as just as deadly if not more so. Measles out break right now and influenza out breaks taking childrens lives. Autism is not killing many in masses which is the out come of such fear tactics against immunizations. Your statement “Our children are afflicted with Autism because of the pollutants in our food, water, and air” comes off as being rather definitive. Do you believe it to be true (i.e. your subjective opinion), or do you know it to be true (objectively verified)? I can’t believe the government is doing this to our kids. They should be ashamed and so should the drug companies! You do realize that they have isolated one of the genes that causes autism. There is some interesting work done linking aspartame, when ingested by an expecting mother, and ADD, ADHD and autism. I do not know when autism came on the scene but aspartame was approved in 1981. An interesting connection, sharkey. I think Saccharin was on the scene long before 1981, too, so there’s another possibility. I remember back in the early 1960’s my cousin had type 1 diabetes (it took quite a while for doctors to figure out what was wrong with her, that’s how UNcommon diabetes was then) and she used to have to use some stuff called Sweet 10 and I’m not sure what the base of that stuff was, but probably saccharin or something similar. It was awful tasting stuff. She continued to have problems throughout her short 35 year life, and died of a stroke after years of seizures, etc. There could most definitely be a connection to all kinds of physical ailments from chemically concocted sweeteners, just to name one thing amongst the dozens of chemical time bombs we may be living with today. For sweetness, I still think real sugar is the best bet even if you’re diabetic. You would have to certainly know your limits but it seems a lot more safe than the unknowns.